Earlier this semester, I attended a very interesting lecture series on cyber warfare. The director of the University of Toronto's Citizen Lab, Ron Deibert, spoke to us about the lab's work. The center focuses on digital security issues that arise from human rights concerns - this involves surveillance, censorship, mobile privacy, and many other topics. What was very interesting for me about the talk was the intersectionality: the Citizen Lab combines methods from computer science, political science, area studies, and law to properly explore its work. Dr. Deibert made sure to emphasize that the lab is not an activist or advocacy group but rather a center for generating peer-reviewed research. The effects of this research have been impressively far-reaching, and reports are published and highly regarded by the community. The capacity to connect is outstripping the capacity to secure. Democracy is in retreat, and authoritarianism is resurgent. Today sees a booming surveillance industry with proven abuse potential. These three ideas combined make for a pretty dismal view of the future - if nothing is being done to provide matched security to the heightened number of connected devices around the globe. For me, this event combined two huge interests for me - computer science and international studies - and brought up interesting questions about the ethics of computing, questions I will be pondering for a while to come. Wow. It is difficult for me to believe that I will be a graduate of this university in just under two weeks. It is so cliche to say it, but the time has legitimately gone by in what feels like the blink of an eye. If there are any new GEFs reading this, PLEASE make sure to enjoy your time at OU as much as you possibly can. It will be over before you know it! When I was applying to OU, seeing the new Global Engagement Fellowship program was a big pro for this university in my eyes. Since I was in middle school, I’d dreamt of studying abroad, and it was wonderful to see a university that promoted study abroad so heavily. I was overjoyed to be selected for this program, and I have been so blessed with all of the wonderful experiences that have come out of it. I still maintain that studying abroad was the best decision I made in college. It was both incredibly fun and incredibly challenging. It taught me to use a foreign language effectively, to be confident in my ability to navigate in unfamiliar situations and places, and to see the world in a different way. Again, this all sounds so cliche, but this cliche exists for a reason. Studying in another country really does change you for the better, and if you are at all interested, I urge you to apply. OU has TONS of study abroad scholarships that make it financially feasible. Every day, the international community gets more and more connected. No one country can exist as an island anymore, even if it wants to. Because of this, I am so grateful to this program for encouraging me to learn as much about the international community as I possibly could. Now more than ever, this knowledge is vital, and I’m leaving OU knowing that I am a much better-educated and more well-rounded person than I came as. The moral of this sentimental story is that OU is amazing, the Global Engagement Fellowship is amazing, and studying abroad is even better. I am still having trouble coming to terms with leaving, but I take comfort in the fact that sadness at leaving means that I got to experience something truly awesome. Thank you to Bushra, thank you to Jaci, and thank you to all of my fellow GEFs for making these last four years unforgettable! Music has always been deeply tied to a culture’s sense of identity, and it can simultaneously strengthen that identity and tear it down. A Middle Eastern group that seems to exemplify this sometimes contradictory nature of music is Mashrou’ Leila, a Lebanese band formed in 2008. The group has gained significant attention, mainly due to its openly gay singer Hamed Sinno and often controversial song topics, which range from corrupt government officials to homosexual relationships. In these songs, the group is able to reflect popular sentiments (such as anger and frustration at the government) and shine a light on overlooked or ignored issues (like the treatment of homosexual persons), often in the same album. They both reflect the culture and refract it, showing the pain and struggles as well as the beauty. One of their songs in particular, “For the Homeland,” highlights popular criticisms of the Lebanese government, although it can be applicable to many other governments in the Middle East. It includes lyrics such as “they quiet you with slogans about every plot” and “you sell your freedom,” emphasizing the coercive and oppressive nature of the state. The lyrics are highly critical of Arab governments, which makes sense since this song is from their 2013 album, their most recent after the Arab Spring. However, Mashrou’ Leila’s songs focus on cultural topics as well, such as the treatment and experiences of homosexuals in the Middle East. Some of their songs, specifically “Shim el-Yasmine” and “Kalam,” deal explicitly with homosexuality, with lyrics like “I would have liked to keep you near me, introduce you to my family…be your housewife.” While many Arabic songs seem like they are being sung to men, since they are often conjugated in the male form, “Shim el-Yasmine” emphasizes this relationship, making it clear that it is one man singing to another man about their relationship. 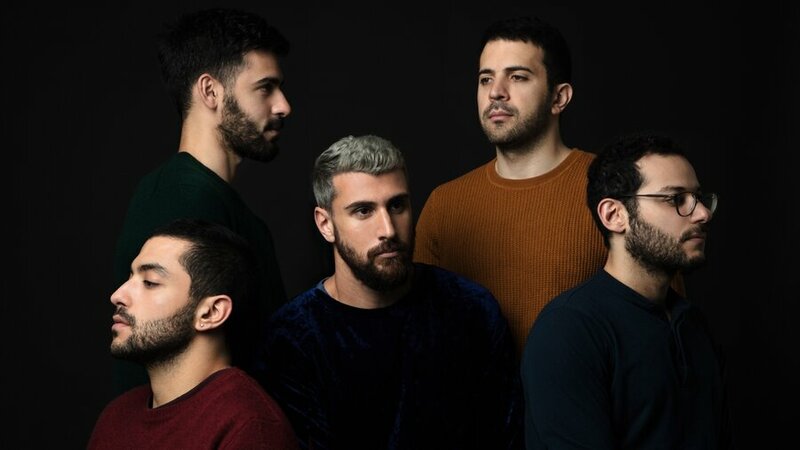 As Mashrou’ Leila’s songs deal with controversial subjects, such homosexuality, many Arab countries have sought to censor them or limit their influence. Jordan was one such country, as they repeatedly gave the band permission to perform, and then banned the group. Additionally, Egypt allowed the band to host a concert, but after images appeared on social media showing rainbow flags in the crowd, the Egyptian police arrested seven individuals who attended the concert. Egypt’s musician union also denounced the concert and stated that it was considering banning the group from the country. The treatment of Mashrou’ Leila and individual’s reactions to their music can serve to reflect how Arab culture writ large views these issues. Music often reflects society, and Mashrou’ Leila helps hold a mirror to Arab culture in particular. Do you agree or disagree with the freedoms? Explain. Which do you support, and which do you think are excessive or provide too much freedom? Optional: If you are willing to do so, please share your political leanings—Republican, Democrat, Independent, not sure, disaffected, apathetic, or other. When I asked her if she knew what this was she said she was not sure what amendment it was but did in fact know it was an amendment! Overall, the patterns that I saw were pretty much the same no matter the gender or age. However, with my mom and step-dad, since they are older, they are more aware of political things going on in this country and have true opinions. Oftentimes, we make our political opinions when we are older because we are able to actually decide on our own what we believe is right or wrong and not just what our parents believe. Also, since both my mom and step-dad have completed college and have degrees, they are more educated on these types of issues and have been exposed to all of these freedoms being tested and stretched. Overall, all of my subjects are supportive of the First Amendment as it has made this country what it is today. The patterns show that all of the people who I asked are Republicans and I believe that is mainly based on where/who I am asking. Most of these people are from areas where being a Republican is the norm and we all live in a tiny bubble that condemns anything that could be slight liberal. I think the way that my interviewees judged the freedoms were exactly what was to be expected in this era and age of political unrest. Overall, I saw that the common issue regarding all of these freedoms was freedom of press and speech. Freedom of press is a huge issue these days especially with our current president, as well as the fact that most press is liberal and decide that no matter what Trump does, everything is bad. They refuse to point out the goods that he has done and only the things that could shame him and make Trump seem like a bad president. According to the First Amendment Center, most people nowadays find that Americans have too much freedom. Although I think that is sort of crap, I slightly agree. We think that we can speak however we want without getting harmed or without being deemed incompetent or disrespectful… which is so incredibly false. We have to respect everyone and especially our president. I was always told by my mom that even though I didn’t like Obama, I still had to respect him as he was the most important person in America… but those liberals fail to do the same in regards to Trump. I agree with the rights because without them our country would not be a working democracy. I support the freedom of press because it allows all opinions to be printed without government censorship. If this was not our right, we would never be fully informed. Everyone I talked to agreed with the freedoms of the first amendment. I think that everyone also agreed that it depends on your interpretation of the constitution and how people choose to use them on a day to day basis that determines what it means for them to be excessive or not. Overall, I think people agree it is a sufficient amendment and provides rights as well as security through the United States. The people I interviewed were in support of the first amendment because it provides us with basic freedoms they saw as fundamental to their rights. it is important to note that all my interviewers are citizens of America and knew the constitution and their rights given to them in the First Amendment. My interviewees saw the freedoms established in the First Amendment as necessary and proper, which was the goal of the Bill of Rights in the first place. I think that it is pretty incredible that all this time later, we as a nation can still agree that these are fundamental human rights and deserve to be protected as such. however, having grown up with the First Amendment and knowing it, I was expecting agreement on these rights. The Cold War and Beyond? This past week, I attended a lecture by Dr. John Fishel, a professor at the University of Oklahoma. 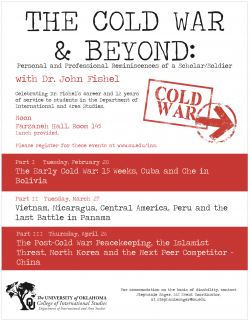 Dr. Fishel’s talk was part of a three-part series that focused on the Cold War; part three was dedicated to “peacekeeping, the Islamist threat, North Korea, and the next peer competitor (China).” I found this lecture particularly interesting because Dr. Fishel was speaking from his own experience, or he was recounting the experiences of people he knew. For example, one of his former students was a leader when the United States was doing some peacekeeping work in Africa right after the end of the Cold War. He also told an entertaining anecdote about Jimmy Carter and Colin Powell chasing down Haitian General Cedras to discuss peace and work to avoid an American military invasion of Haiti. However, Dr. Fishel’s main point was that just because the Cold War ended, that did not mean that we were in a safer world. After the fall of the Soviet Union, Yugoslavia disintegrated and fought itself in several civil wars. Many other states fell to coups and dictatorships, with some resulting in bloody civil wars. Then September 11 happened, traumatizing the world. Not long after the United States began its war in Afghanistan which, at almost 17 years, is America’s longest war. The power politics and general climate of global fear did not end with the Cold War—it is still happening today. Recently, the University of Oklahoma hosted a member of Amnesty International who gave a lecture on the Rohingya and the current refugee crisis in Bangladesh. Everyone has heard the news mention the Rohingya population, but I did not know all of the details and I wanted to learn more about the situation. This lecture seemed like a good place to start. The lecture began with an in-depth look at the crisis, highlighting specific individuals and the horrific events they experienced. The speaker hoped to humanize the situation and give the audience an appreciation of the human costs of the crisis. While I knew that the Myanmar military was burning Rohingya villages and driving them out, I did not know that they were then clearing what remained of the villages and building on top of them. The structures varied, but many seemed to be either new military outposts, villages for different ethnic groups, or secure “villages” that the Rohingya might be forced into. The lecture also informed me of the history of the Rohingya crisis, which did not begin as recently as I had thought. The conflict truly began in 1982, when the government passed a law that stripped the Rohingya of their citizenship and gave them a “half citizenship,” where they could not move around the country without a government-issued identification card. This eventually led to apartheid, where everything from schooling to medical treatment was segregated. The truly horrific acts began taking place when the general public began supporting the military in 2012. Since the worst of the violence in August 2017, over 671,000 Rohingya have fled to Bangladesh, meaning that over 80 percent of the Rohingya population have been driven out of their homes. While the infamous village burnings have largely stopped, the Myanmar army turned to forcibly starving the remaining population in the hopes of driving them out. This is mainly done by restricting the Rohingya’s access to rice, burning markets, and preventing humanitarian aid from reaching the Rohingya. The Rohingya are still living in a nightmare, and this lecture helped explain the issue, its history, and its what is currently happening. You can learning more from Amnesty International by clicking HERE and you can donate to the Rohingya refugees through the UN by clicking HERE.